This moving song memorializes the author's wife. In April 1943, she perished in the Vilno ghetto in April 1943. 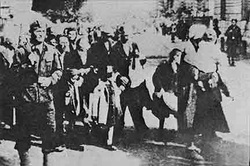 In September 1943, Kaczerginski joined the partisan forces following the liquidation of the Vilno ghetto. After the war he compiled several hundred poems as well as song lyrics. He survived the war only to succumb to his death in a plane crash . This occured in 1954. The music is composed by Abraham Brudno in April 1943 in Vilno ghetto(Luthvania). Following the liquidation of the Ghetto in September 1943 was deported to a concentration camp in Estonia, where he was executed by the Nazi SS (Schutzstaffel). In the Holocaust of World War II, The Vilna Ghetto was a Jewish ghetto established by Nazi Germany, in the city of Vilnius. It was in the occupied Lithuanian Soviet Socialist Republic . In its two years of duration, starvation, disease, street executions, maltreatment and deportations in concentration camps and extermination camps reduced the population of the ghetto from an estimated 40,000 people to zero. Only several hundred people managed to survive. They found refuge in the forests or joined the Soviet partisans, or found shelter among sympathetic locals. Un betl a bisele zun. Un gib es op mayn glik. In troyer, der toyer farmakht. Zey vanynen, far zey iz oykn nakht. Ot do hostu libster gevart. A freydiker geystu tsu mir. There's no-one to care for me now. Will somebody please show me how? Is as bleak as today. The windows are broken and bare. They wilt in the wintery air. The place where you held me so tight. To send spring so early this year. You want me to welcome you here? But sunlight and tears make me blind.